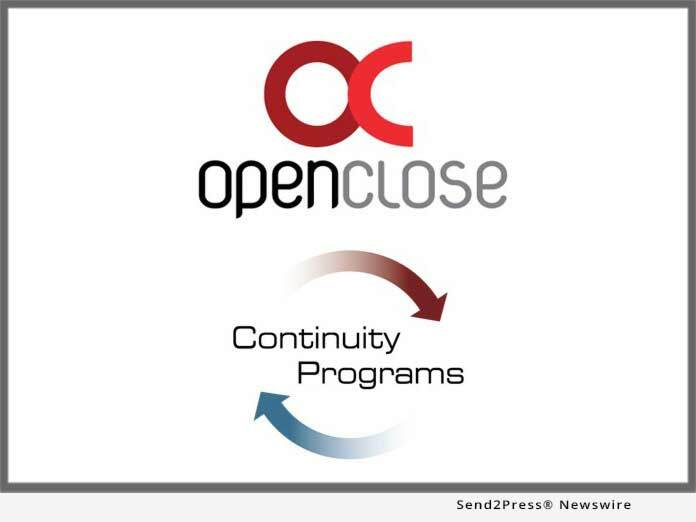 WEST PALM BEACH, Fla., Feb 21, 2019 (SEND2PRESS NEWSWIRE) -- OpenClose(R), an industry-leading multi-channel loan origination system (LOS) and digital mortgage fintech provider, announced it has completed an integration with Continuity Programs, Inc.'s cloud-based MyCRMDashboard.com customer relationship management (CRM) software. This new interface provides OpenClose's LenderAssist(tm) LOS customers the ability to seamlessly interact with Continuity Programs' platform. "We constantly look for opportunities to help our customers do business faster, smarter and cheaper including arming loan officers with cutting-edge tools to close more deals," said Vince Furey, CRO at OpenClose. "We are pleased to offer our customers Continuity Programs' robust and modern CRM solution to help mortgage origination teams achieve greater sales success." Continuity Programs' MyCRMDashboard.com is a turnkey solution that centralizes contacts in an organized, easily-accessible fashion. It gives loan officers powerful tools to generate, track and convert high quality borrower leads while keeping in touch with prospects, customers and referral partners, effortlessly. The CRM is feature rich, automating often mundane and time-consuming daily tasks while delivering the analytics and reporting that enables lenders to assess performance with KPIs, monitor customer satisfaction, improve the borrower experience and increase customer retention. OpenClose's LenderAssist LOS is an enterprise-class platform that offers a suite of modules to automate complex areas of the entire mortgage manufacturing process. The company recently added a comprehensive digital POS solution, closing the loop between POS and LOS and creating the mortgage industry's only consolidated digital POS and LOS platform delivered by a single vendor that is truly browser-based and has multi-channel automation capability. The complete solution is helping OpenClose customers slash the cost to manufacture loans. "Integrating with MyCRMDashboard.com empowers loan officers with many easy-to-use tools to make them as successful as possible amid tough marketplace conditions," stated Kirk King, president of Continuity Programs, Inc. "Integrating our mortgage CRM software with OpenClose's LOS makes it easier for lenders to seamlessly extend this functionality to their loan officers via LenderAssist." Continuity Programs leveraged OpenClose's RESTful API to rapidly develop and deploy the integration between MyCRMDashboard.com and LenderAssist. The RESTful API suite offers simplicity, reliability, better communication, seamless data exchange and performance optimization. Lender implementations of MyCRMDashboard.com are quick and non-disruptive, with Continuity Programs doing the heavy lifting for customers and providing all training. Continuity Programs, Inc. serves mortgage lenders, banks and credit unions with easy-to-use customer relationship management (CRM) software called MyCRMDashboard. The compliant SaaS software suite includes automated marketing and reputation management. Since 1973, Continuity Programs' campaigns have consistently proven to drive referrals and repeat business, generate exclusive leads, and increase client retention for loan officers across the US. For more information, visit continuityprograms.com or call (800) 521-0026.